Thank you so much to Leah, who nominated me for the Liebster Award, which in German means favorite or beloved! :: Choose 5 other deserving blogs with less then 200 subscribers to nominate and link their blogs in your post. :: Tell your nominee's you have chosen them for this award by leaving a comment on their blogs. :: Answer the 5 questions the tagger has asked you and ask your own 5 questions to the people you nominate. :: It might not look like it but I love tattoos! As of now I have 5 but have many more planned for the future. 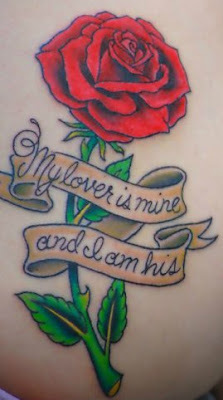 My favorite tattoo so far in a singe red rose on the upper right hand corner of my back with the verse my lover is mine and I am his from the bible. :: Blogging has become my "thing"! It is not only a creative outlet for me but blogging has allowed me to meet so many amazing woman that I otherwise would never have gotten the chance to meet! :: I'm extremely passionate about natural birth, natural parenting, and alternative medicine. I wasn't always so passionate about it but having my daughter has really opened my eyes to what I'm putting in her body and also mine. :: I love getting all dressed up and being girly but its not often that I get to do so. :: I grew up in Illinois and then when I was 20 years old I moved to Washington State and lived there for almost 5 years. After having Chloe both Mike and I thought it would be best if we moved back home to Illinois and in March we finally made the big move and couldn't be happier about our decision! :: What do you do for a living? If you are a SAHM what did you do before having kids? Before having Chloe I worked as a nanny. For the past several months I have been searching for a part or full time nanny job that I can bring Chloe with, I am ready to go back to work again and also it is much to difficult for us to live off of one income. Just recently I have had a few interviews and might be getting a job soon! :: What is your least favorite household chore and why? I hate putting away laundry! I don't mind washing our laundry but for some reason I always dread having to hang it up. I'm getting better at this though! Also, since moving in with my family I really don't like emptying the dishwasher, it takes way too long since there are so many dishes to put away. For some reason though I don't mind filling up the dishwasher though! :: Why did you start your blog? I started my blog shortly after finding out I was pregnant with Chloe. It became a way for me to document this incredible journey of Motherhood. :: Where would you like to see your blog go in the next year? This is a great question! and to be honest I haven't really thought that far ahead yet. I guess I would love for it to continue to grow and to connect with more Mothers through my blog. I would love to write more meaningful posts and also I hope that over time I can work on improving the way my blog looks. :: If you could offer one piece of parenting advice to your readers what would it be? Another really great question but a tough one! I would have to say my number one advice would be to enjoy your children. Make memories, get messy, play together, say yes, cuddle and kiss and be silly because we're only given one childhood. :: What do you enjoy most about being a Mom? :: What do you miss the most about your life before you had children? :: Why did you start blogging and how long have you been blogging for? :: What do you love the most about blogging? :: What would your perfect day look like? Your welcome Lindsay, I love reading your blog and about your sweet family! I am so glad I have gotten to know you better! Thank you for your sweet words!! Your welcome Kate, I love reading your blog and seeing pictures of your beautiful family! I look forward to reading your liebster award post soon, its always so fun getting to know people better! and yes that would be so fun to meet up!